COVER: A great game and a great book for beginner and expert alike. 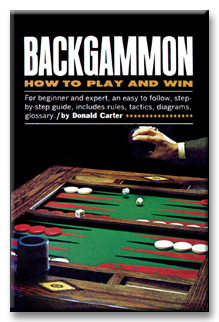 Whether you want to play for fun or money or both, this guide will teach all you want to know about backgammonthe most action-packed, exciting and challenging game of skill and chance ever devised. The game dates back at least 5,000 years and was truly the sport of kings. One emperor wrote a book about it; another is said to have played the game at $15,000 per point. Today, with a resurgence of interest in the game on an internation scale, backgammon is being played for fun in living rooms and for money in plush casinos across the globe. And this book will allow you to compete with the best of playersand win! Includes: Nearly 100 easy-to-follow diagrams; rules for playing; back and running game analysis; dice lore, numbers & probabilities; diagram of a complete game, from opening move and replay to end game; tournament play; glossary.